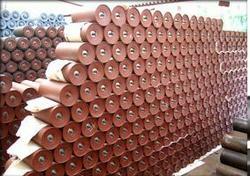 Prominent & Leading Exporter from Coimbatore, we offer idlers, hdpe rollers, idler brackets and conveyor idlers. 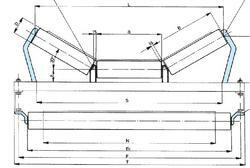 Rollers, very often, represent a high investment in the overall requirements of the project design of a belt conveyor installation. The choice of high quality rollers that guarantee an adequate working life with the result that equipment may function without the business of the plant being interrupted. It has been well proven that considering the overall economies in today’s modern conveyors, their life and efficiency depends to a great deal on the choice of quality rollers, accurately manufactured using highly selected materials. Of particular importance in the search for efficiency is the sealing system that protects the roller bearings. Idler Frameprime precisions supplies a wide variety of various types of modular conveyor structure, for overland and underground conveyors both roof slung and floor mounted. 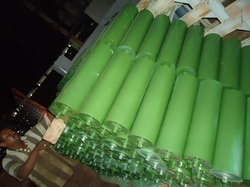 Conventional and “Belt Saver” type conveyor structure is manufactured and supplied in painted or galvanized finish. 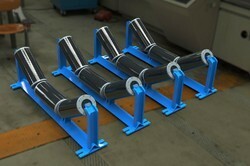 The Belt Saver frames protect the belt if the conveyor rolls were to come out of the frames. 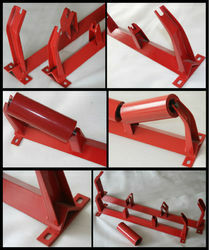 Looking for Idlers & Brackets ?